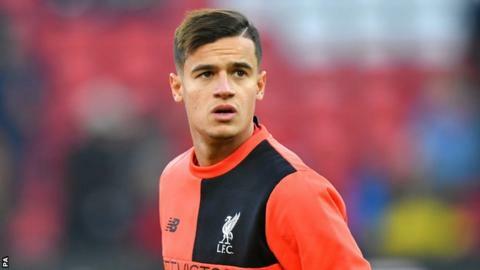 Liverpool are damaging themselves by refusing to let midfielder Philippe Coutinho leave for Barcelona, says ex-England international Jermaine Jenas. The Reds have rejected three bids - the latest worth about £114m - from the Spanish giants for Coutinho, who last week submitted a transfer request after the club's owners released a statement insisting he would not be sold. Speaking on BBC Radio 5 live's Friday Football Social, Jenas said Liverpool's stance was like "cutting off your nose to spite your own face". He added: "Coutinho has done brilliantly for Liverpool. Yes, they have helped develop him, but the fact is that now the deal of a lifetime has presented itself - not just for him but for the club. "Once the owners started to get involved, though, it became about power. It's one thing it coming from the manger's mouth - there being a feeling that he shouldn't be sold - but now they are in a situation that sets a precedent for future deals." Barcelona have moved for 25-year-old Coutinho - who signed from Inter Milan for £8.5m in 2013 - after selling Brazil team-mate Neymar to Paris St-Germain for a world record transfer fee of £200m. Liverpool, meanwhile, have made two acquisitions this summer. Egypt and former Chelsea winger Mohamed Salah arrived from Roma for £34m in June, before the club paid Hull City £10m for Scotland left-back Andrew Robertson last month. "The timing is a problem," added ex-Tottenham and Newcastle midfielder Jenas, 34. "Barca have got themselves into this situation by selling Neymar when they did, and Liverpool have struggled to make the signings they wanted. "If Coutinho goes now, they know they will be in an even harder position - because they failed with bids for Southampton defender Virgil van Dijk and RB Leipzig midfielder Naby Keita and there didn't seem to be a 'Plan B'. "But what's also weird about this situation, and another reason why Coutinho probably feels hard done by, is that Liverpool have sold star players in the past - like with Luis Suarez and Raheem Sterling. "We had something similar with Dimitar Berbatov when he left Spurs for Manchester United in 2008. "If a player deserves to move on to bigger things, like Barcelona, it should almost be like: 'Thank you for everything, you've done brilliantly, now on your way.'" Liverpool's instant dismissal of Barcelona's third offer is further hard evidence of the determination within the club that they will not be forced into selling their prize asset under any circumstances. Fenway Sports Group, and manager Klopp, remain unmoved by Barcelona's increased financial inducements - as well as a transfer request from a player who has clearly had his head turned. Liverpool regard this latest bid, understood to be about £114m, as irrelevant because their stance, as it has been from day one, is that Coutinho will not be sold. But questions remain. Will Barcelona take the hint and walk away? Will Coutinho, sidelined by a back injury, accept his dream move will not come to fruition and eventually return to the fold? Will his unhappiness increase at the prospect of a switch to the Nou Camp slipping away? For all the noises coming out of Barcelona that a move is "close", it remains as far away as the day they made their first approach. Liverpool's mood has not altered.